A woman’s inner man, her animus, is strongly coloured by her experience of her personal father. Just as a man is apt to marry his mother, so to speak, so a woman is inclined to favour a man psychologically like her father, or, again, his opposite. A woman’s animus becomes a helpful psychological factor only when she can tell the difference between her inner man and herself. While a man’s task in assimilating the anima involves discovering his true feelings, a woman must constantly question her ideas and opinions, measuring these against what she really thinks. If she does so, in time the animus can become a valuable inner companion who endows her with qualities of enterprise, courage, objectivity and spiritual wisdom. 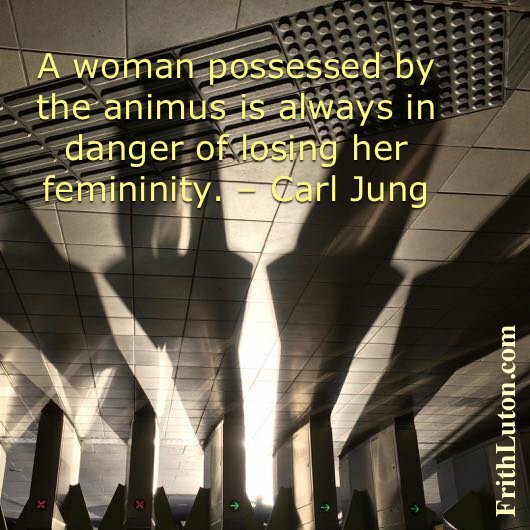 Jung describes four stages of animus development in a woman, paralleling those of the anima in a man. He first appears in dreams and fantasy as the embodiment of physical power, for instance an athlete or muscle man, a James Bond or Sylvester Stallone. This corresponds to the anima as Eve. For a woman with such an animus a man is simply a ‘stud’; he exists to give her physical satisfaction, protection and healthy babies. In the second stage, analogous to the anima as Helen, the animus possesses initiative and the capacity for planned action. He is behind a woman’s desire for independence and a career of her own. However, a woman with an animus of this type still relates to a man on a collective level: he is the generic husband-father, the man around the house whose primary role is to provide shelter and support for his family—Mr. Do-All, Mr. Fix-It, with no life of his own. In the next stage, corresponding to the anima as Mary, the animus is the Word personified, appearing in dreams as a professor, clergyman, scholar or some other authoritarian figure. A woman with such an animus has a great respect for traditional learning; she is capable of sustained creative work and welcomes the opportunity to exercise her mind. She is able to relate to a man on an individual level, as lover rather than husband or father, and she seriously ponders her own elusive identity. In the fourth stage, the animus is the incarnation of spiritual meaning—a Mahatma Gandhi, Martin Luther King or Dalai Lama. On this highest level, like the anima as Sophia, the animus mediates between a woman’s conscious mind and the unconscious. In mythology he appears as Hermes, messenger of the gods; in dreams he is a helpful guide. Sexuality for such a woman is imbued with spiritual significance. Any of these aspects of the animus can be projected onto a man, who will be expected to live up to the projected image. As mentioned earlier, the same is true of the anima. So in any relationship between a man and a woman there are at least four personalities involved. Theoretically, there is no difference between an unconscious man and an unconscious woman’s animus. One implication of this is that an unconscious man can be coerced into being or doing whatever a woman wants. But it’s just as true the other way around: unconscious women are easily seduced by a man’s anima. In relationships there are no innocent victims. The more differentiated a woman is in her own femininity, the more able she is to reject whatever unsuitable role is projected onto her by a man. This forces the man back on himself. If he has the capacity for self-examination and insight, he may discover in himself the basis for false expectations. Failing inner resources on either side, there is only rancour and animosity.